I HATE TO EXERCISE !!! SOON TO BE MY NEW DESK CHAIR ! I sit at my computer for long hours everyday..I try to get up and walk around every hour for at least 5 minutes..and try to do some stretches etc. It just ISN'T enough!..I really don't like to interupt my thought process while I'm on the computer..and let's face it I'm lazy when it comes to exercise.. it bore's me, to say the least.. Yes, I've had the giaim ball for awhile but again, I'd have to take time away from what I'm doing on the computer to use it.. I'm so happy to have FOUND MY SOLUTION...the GIAIM ball chair !!! I'LL BE EXERCISING !.. These balls are great for children also, expecially the overactive ones..It helps them get their wiggles out ! A workout with an exercise ball can be a beneficial way to help improve muscle tone and balance. Exercise balls are air-filled and comfortable to use during fitness workouts. They are lightweight and durable. Some of the colorful exercise balls can support up to 600 pounds. It is not uncommon for the exercise ball to be referred to as a Swiss ball, stability ball, gym ball, or a yoga ball. The good news is that you don't have to be a personal trainer or a physical therapist to use an exercise ball. 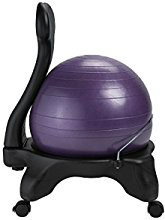 An exercise ball may be used with yoga or with a Pilates exercise program. It may also be used for physical therapy purposes. Always remember, it is advantageous to check with your doctor before beginning a fitness exercise program, especially if you have any injuries or medical conditions. People may use exercise balls to stretch their muscles or do basic abdominal exercises. They can be used for low-impact aerobic exercise and strength training exercise routines. Incorporating an exercise ball into your fitness routine can help develop core strength, flexibility, and balance. We offer a variety of exercise balls and other fitness equipment to help you stay active and healthy. www.aginglifestylesecrets.com ..click 'shop' scroll down left column to search for GIAIM ball chair's.. I love my age ! Experienced enough to do it right ! !